We are responsible hobby breeders. 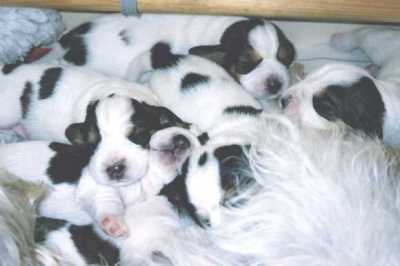 PBGVs are our passion not our business and, as such, we breed extremely rarely - and only after much research and study. We have devoted countless hours and years learning about our chosen breed, studying pedigrees, taking on board genetics, understanding what health issues the breed faces, talking to many in our breed and going over PBGVs both in England and overseas. We have only ever bred to maintain our Monkhams line, important to us as it was something husband and father Bernie started. We occasionally have a carefully considered litter bred for quality, soundness and type. We follow all breed health screening recommendations, strive for quality and are committed to producing healthy puppies that conform to the breed standard. Our dogs live in our home, so puppies are born indoors and receive round the clock attention and socialisation from birth. We spend an equal amount of time ensuring they go to suitable, loving and forever homes. 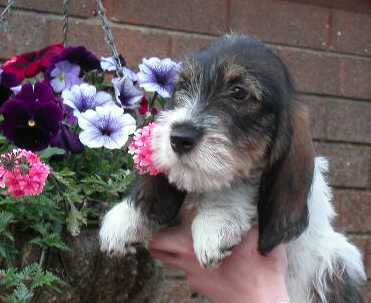 As prospective owners, if you live in the UK, we always ask that you meet us, our PBGVs and the puppy's mother. We will ask you questions and won't be afraid to let you know if we think this isn't the breed for you. Our PBGVs that go overseas only go to those we know or by recommendation. The price we charge for our puppies is never profit but investment in the next generation. We share our knowledge and pride ourselves on the lifetime of advice, support and care that we offer all owners of our puppies and we encourage all to stay in touch with us. Our pups are all Kennel Club registered and come with KC insurance for the first few weeks of their lives. Normally, we do not let our pups go to their new homes until they are 10 weeks old. This is to ensure they have had a full course of vaccinations. We microchip all our puppies and they are registered with PetLog. 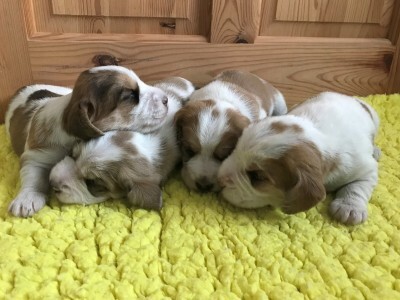 We place endorsements on our puppies, meaning that you will have to ask us if you wish to use yours for breeding and that export is restricted without our approval. We are there for you if a PBGV needs to come back for whatever reason or will help with finding a suitable second home. To this end we support the breed club's rescue and, over many years, have sought to educate people about the breed by producing articles, books, breed information leaflets, training material and websites. If you are sure this is the breed for you and we do not have a litter ourselves, we will always try to help you find a suitable puppy elsewhere. Or, if you prefer to wait for a pup from our own breeding, then we are happy to hold your details and keep you updated. Above all, we are here for you if you need our help. Our PBGVs are our family and owners become our extended family. In this way, we have made some wonderful friends over the years. Combining the Petit Heroes Danish lines of our good friend Jette Ramvad, American favourite lines imported by Diana Sadler and with a fair sprinkling of sound Beaujons and our own.